Program #TURK001. Recorded in Denver, CO on February 28, 1990. Stokely Carmichael was chair of the Student Nonviolent Coordinating Committee (SNCC) and Prime Minister of the Black Panther Party. 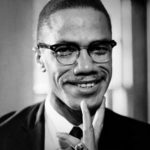 A charismatic speaker, his call for “Black Power” sent shock waves throughout the civil rights movement and the white establishment. In 1969, he moved to Guinea and changed his name to Kwame Ture. From his new base he advocated Pan-African unity. He died in November 1998 at the age of 57.